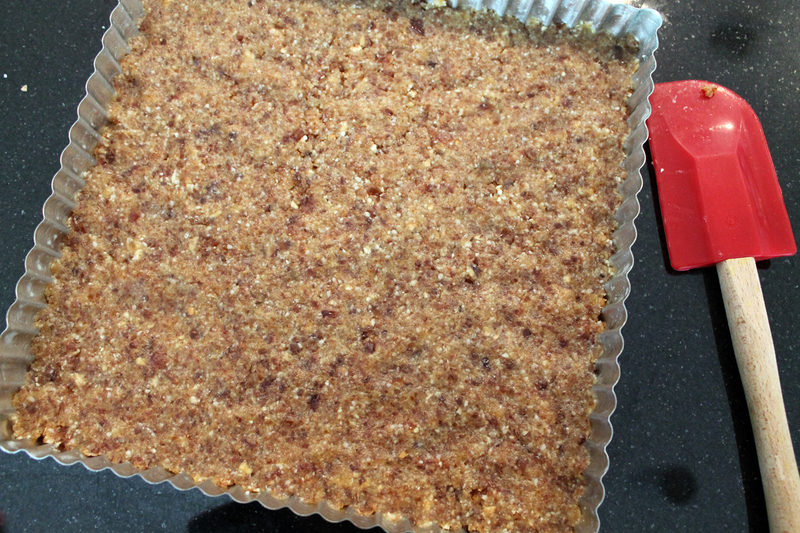 I bring you the raw tart… It’s made of nuts, dates, fruit, honey, coconut oil and salt. That’s it. Good for you ingredients, in their 100% raw, uncooked state. No heat exposure means the nutrients stay in tact, as well as the enzymes, which make the food easier to digest. No heat also means no heat for you – raw foods are cooling for the body. Just what we all need when it’s 100+ out there! Health talk aside, this dessert really is truly delicious. If you’re gluten-free, dairy-free, with this you’re not missing a thing. In fact, it’s even better – with higher quality ingredients, the way they come together so uniquely, the final product is greater than the sum of its parts. There’s nothing better than discovering something that’s gluten-free, dairy-free and tastes even better than the traditional version. I love that. I always think, if I never had to branch out, I might never have discovered the amazing things you can do with nuts. Even for folks who don’t need to avoid wheat or dairy, this is a real dessert. 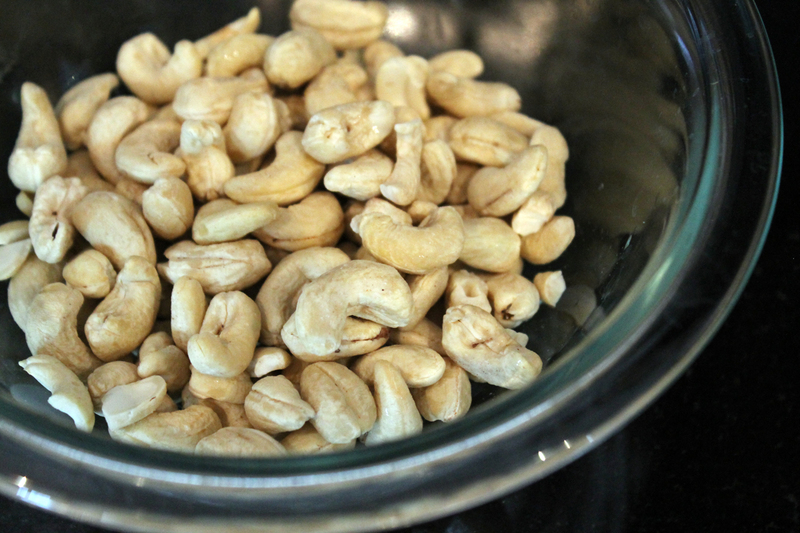 Start by soaking the cashews. Give them about four hours or so, then drain the water and rinse them. Soaking softens them so they’ll blend more easily into a creamy consistency. Soaking also makes the nuts easier to digest. For the crust, you can use just about any combination of nuts. I used macadamia and walnuts. But you could go for almonds, pecans, hazelnuts, etc. depending on what flavors you want. 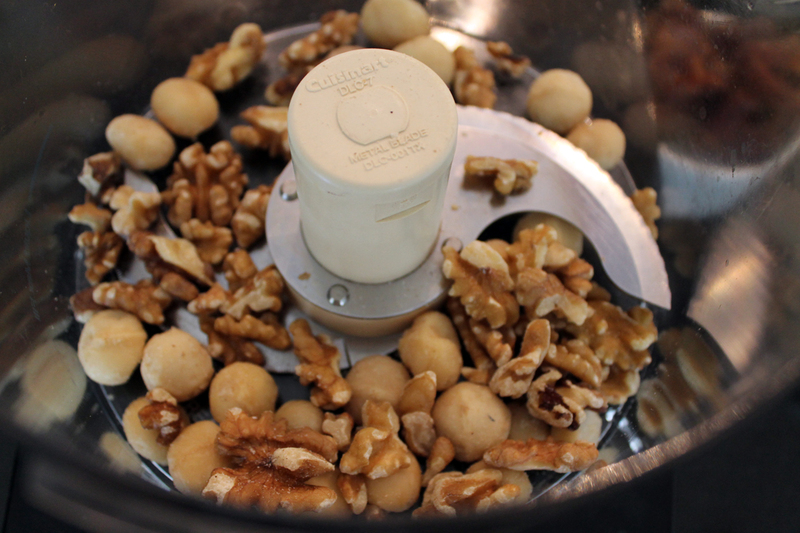 Put the nuts in the food processor and process until finely ground. Then add the dates (be sure to remove the pits first) through the processor’s feed tube while the machine is running. At this point, you can add the vanilla and salt as well. Process until you have an evenly blended gooey mess. Now, transfer the gooey nut-date crust mixture into a greased (with coconut oil) tart pan and press the mixture down evenly to form the crust. I recommend getting in there with your hands to press the mixture into the corners and grooves and get it nice and even. You can use plastic wrap or baggies on your hands to keep clean… and sanitary. Now you’re ready for the filling. 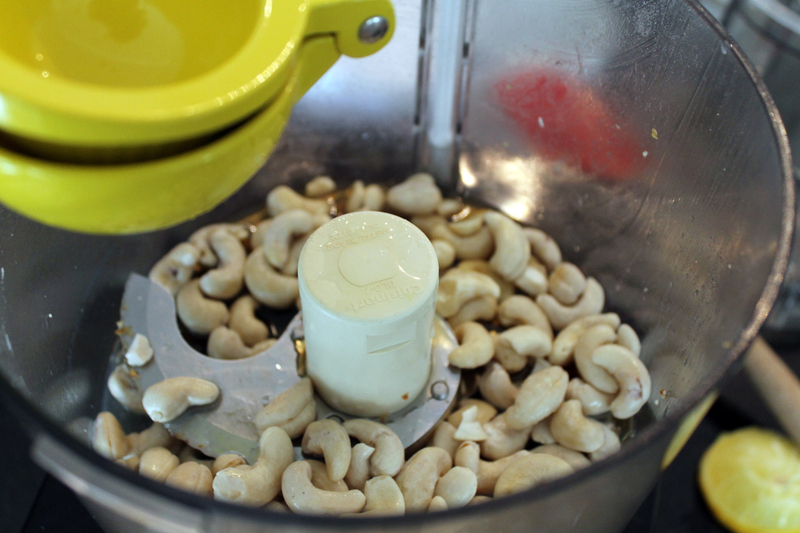 Combine the cashews, honey, lemon and coconut oil in the food processor and process until smooth. Let the processor run (3-5 minutes or so) to get a creamy texture that’s not gritty. You may need to add a little water to thin it out and get the desired consistency. 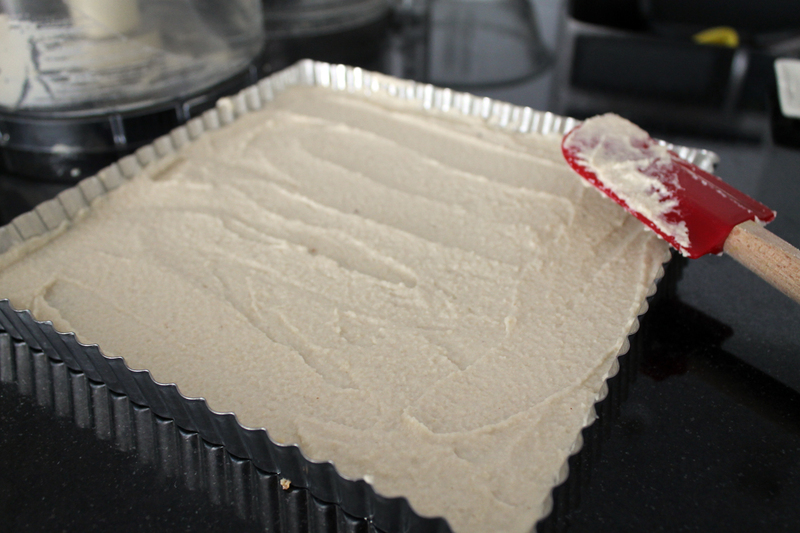 Pour the cashew cream filling into the tart pan and smooth evenly over the crust. A rubber spatula works well to spread the filling and get into the edges and corners. Now comes the fruit. 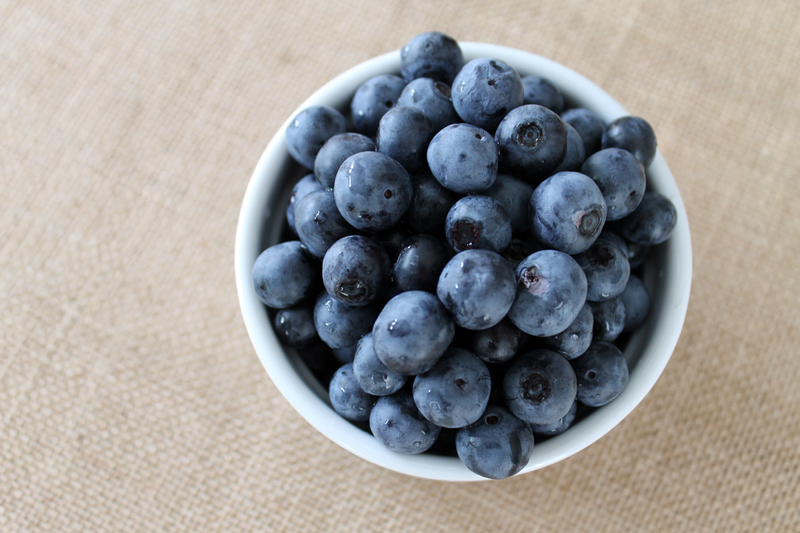 Yum, blueberries — so so good and so so good for you. A rule of thumb… the greater the potential to stain your clothes, the better it is for your body. So eat up! Start with the stars and make a square with blueberries in the upper left corner. Then fill in. 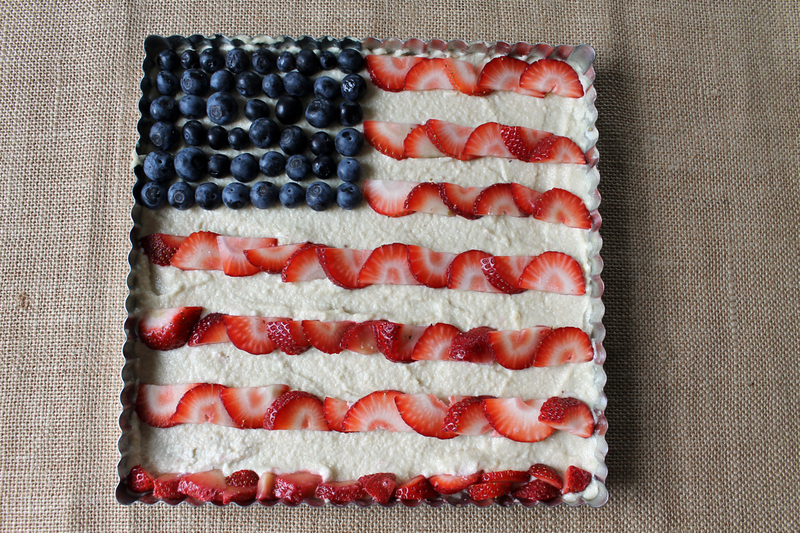 For the stripes, layer the strawberry pieces to form straight lines across. 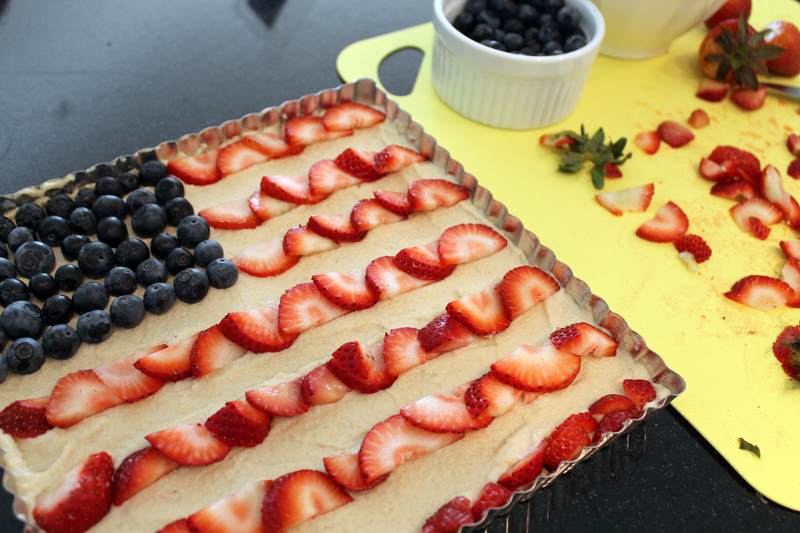 The American flag starts with red at the top, so make a line with strawberries and alternate with white space. Cover with plastic wrap and place in freezer for at least four hours to set. Before serving, remove from tart pan and allow to thaw at least 20 minutes. If you end up giving this a try, I’d love to hear how it turns out. Or if you change it up in any way, please share your variation with us in the comments. To all, I wish you a very happy and safe 4th of July holiday. Put nuts in food processor and process until finely ground. Add dates through feed tube while processor is running. Also add vanilla and salt. Process until evenly mixed and gooey. Grease a rectangular (or square) tart pan with coconut oil. Pour crust mixture into tart pan and press evenly to form crust. 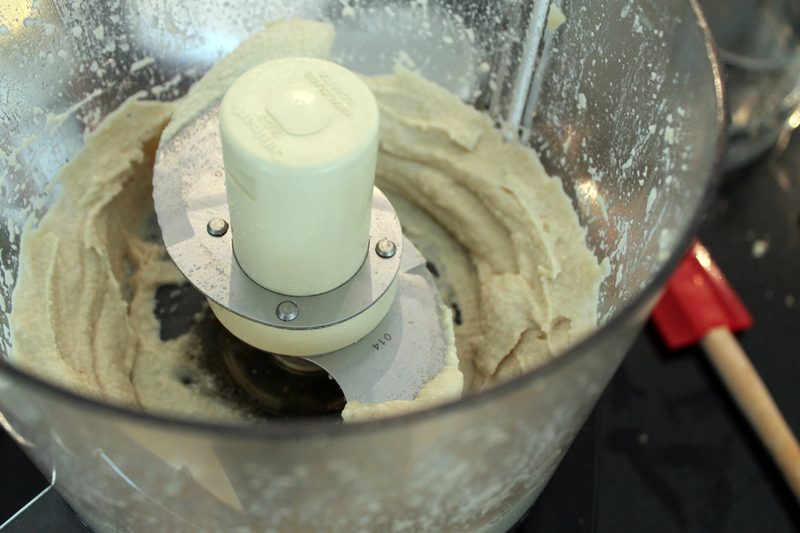 Combine all filling ingredients in food process and blend until smooth. Note: allow processor to run for 3-5 minutes to get a smooth consistency that is not grainy. You may want to add a little water to get desired consistency. Pour filling into tart pan and smooth evenly over crust. Now you’re ready to make the flag. 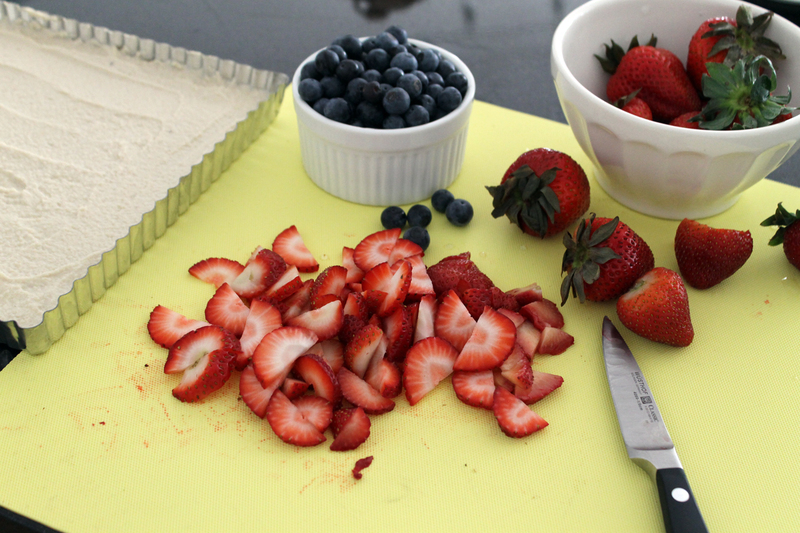 Wash the berries and chop strawberries into small pieces. Make a square by lining blueberries in the upper left corner. Next, start the stripes – red, then white – by lining strawberry pieces to form lines. Cover with a layer of plastic wrap and place in freezer to set, at least four hours. When you’re ready to serve, remove tart from pan and allow to thaw 20-30 minutes before enjoying. Want more sweet and healthy recipes like this one? Get my FREE 10 Healthified Sweets + Desserts Recipe eBook. This free recipe book has some of my favorite treats for a sweet indulgence without the guilt. I hope you enjoy them as much as I do! Wow! this is pretty nice can’t wait to have this . You made it healthier with strawberries and blueberries my favorite berries. I used a square tart pan. I believe 8×8. 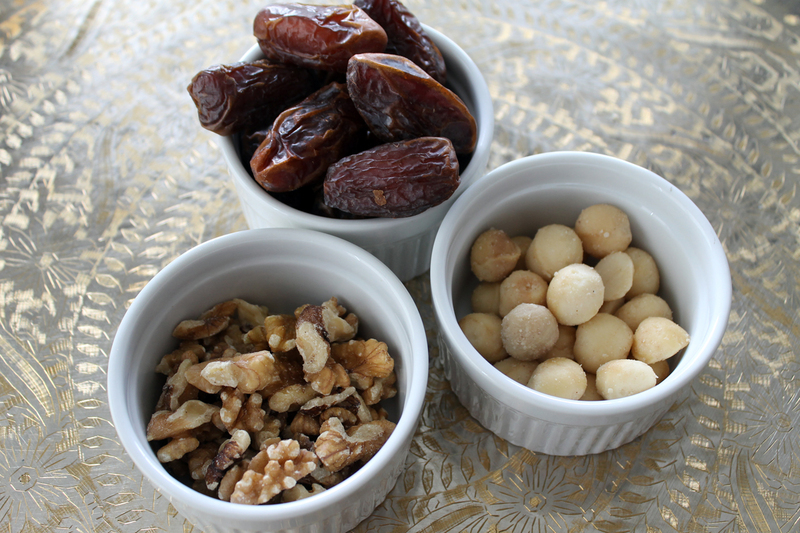 Satisfy your sweet tooth without the sugar crash. My Sweets + Desserts recipe eBook includes 10 sweet treats made without refined sugar, gluten or dairy to help you maintain balanced blood sugar, avoid inflammation and indulge without any guilt. Join my mailing list and get the recipe eBook, plus new healthy, delicious and EASY recipes delivered staight to your inbox every. single. week. Thank you! One more step. Go check your email to confirm your account and then your ebook will be on it's way!